After Eric Dungey went down in the first quarter against Notre Dame, Tommy DeVito stepped in and faced his toughest test yet. Squaring up against the third-ranked Irish, DeVito clearly wasn’t ready for the challenge. To be fair, no one expected him to be. Notre Dame is likely college playoff bound and allows just 17 points per game. DeVito was playing in just his eighth collegiate game and was tossed into the game in the middle of a drive. Right now, the backup quarterback has the luxury of making mistakes. He gets a pass for overthrowing receivers and misreading defenses. Next year he’ll have the pressure of being the guy, but for now he can use the loss as a learning experience. Unfortunately, that’s the only positive DeVito can take from this game. He passed for 105 yards while taking six sacks and throwing a couple interceptions. The picks are not as concerning as the sacks. As the backup, DeVito doesn’t get the same amount of reps with the starters as Dungey, so the timing will naturally be off. On the first interception, DeVito chucked the ball downfield into double coverage. Notre Dame’s safety read DeVito’s eyes the whole way and jumped the route. As DeVito gains experience, he’ll learn to look off defenders. The second pick was a pass right on the numbers to Taj Harris, but the receiver bobbled the ball in the air and the Irish snatched it away. Clearly DeVito’s to blame for just one of the turnovers, but he still needs to improve at avoiding pressure. Too many times, he held onto the ball too long and was sacked. Since DeVito doesn’t have the wheels of Dungey to extend plays, he needs to throw the ball away when the pocket collapses. Next year, he won’t face a defensive front like Notre Dame’s in most games. 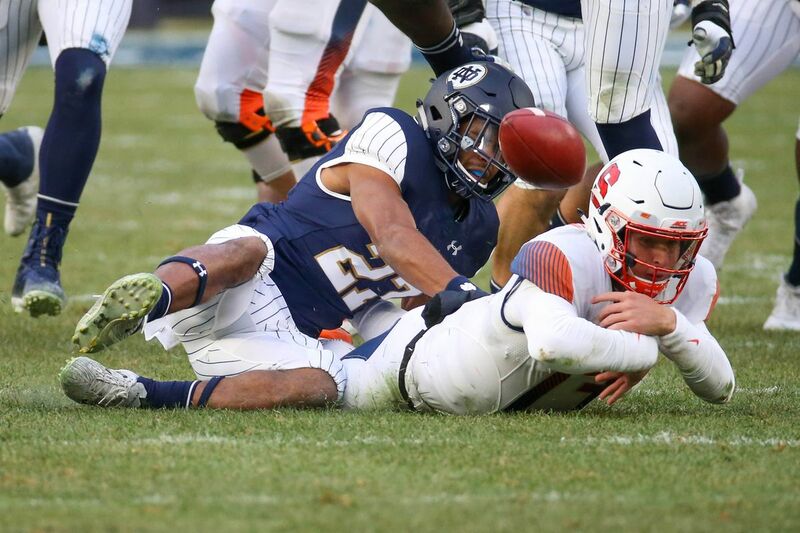 The Irish average almost three sacks a game, which is more than all but three other Syracuse opponents this season (Clemson, Boston College, and UNC). Fortunately, DeVito’s issues are all correctable. He simply needs more time and experience in big games. While he is brimming with potential, he is not yet the star quarterback that some pegged him as earlier this season. He’s still raw and making mistakes. While he seems to be on his way to stardom, he’s not there yet.